Please note: Furnace diorama does not include action figure. Shown for scale purposes only. 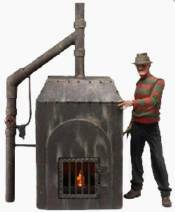 Build incredible dioramas with this detailed replica of Freddy ?s Furnace from the Nightmare on Elm Street films! The nightmarish piece looks exactly like its on-screen counterpart, from the hinged door to the realistic weathering - we ?ve even added a flickering LED light to simulate the furnace flames. Perfectly sized for NECA ?s line of 7" scale Freddy Krueger action figures, and a must-have for any collection. Measures 9" H x 4" W x 4.3" D and uses 3 button cell batteries (included).